Discussion in 'eBay Auctions' started by w1retap, Mar 11, 2019. SamuelL421 and erek like this. revenant, stinger608, wra18th and 4 others like this. New listing shows a PCI 5500. Nice! I need to pay attention to you guys more often. wra18th and SamuelL421 like this. A realistic number is $3000 for a working model. If it was, it would've sure been funny... My friend linked me that right when it went up on eBay and I contemplated PMing you on here about it! 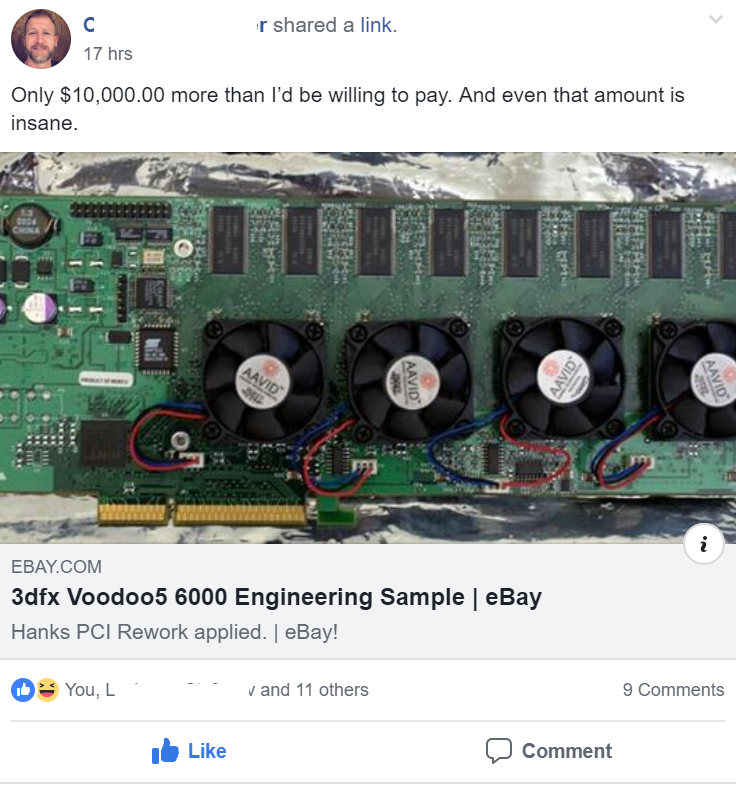 Then I considered that with eBay's ability to let you setup Searches that automatically ping you when new results show up, that you'd have plenty of 3Dfx tailored ones to alert you and already knew. yes, that's correct, i just wanted to see if i potentially got ripped off myself with real-world non-hypothetical offers. w1retap, SamuelL421 and Formula.350 like this. do you think it was a bad idea in some manner or mostly harmless? 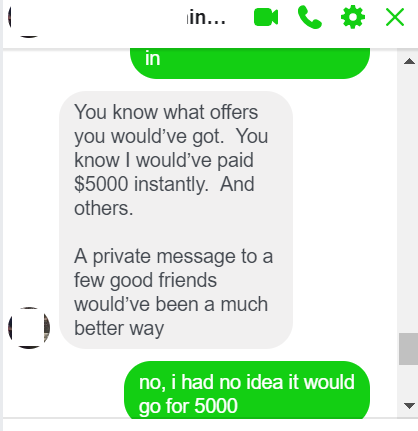 Your reasons were valid, as it's really the only way I can think of to get genuine and unbiased offers (as in not offers from friends who may be willing to pay more). On the other hand... if you didn't have a 6K yet and had seen one pop up on eBay like that, only to disappear shortly after, how would you have felt? Excitement, since it was a huge goal of yours (and you have the money), followed by feeling rather dejected I imagine, and possibly unhappy at the situation. That's just my take. Given I don't have aspirations of owning a 6K (as I find my AA5's to be superior lol), I'm looking at the situation without bias. Not something I’d make a habit of... but I don’t think there is anything inherently wrong in this case. Had someone actually made the purchase and completed the transaction at 15k, that would be a different story. 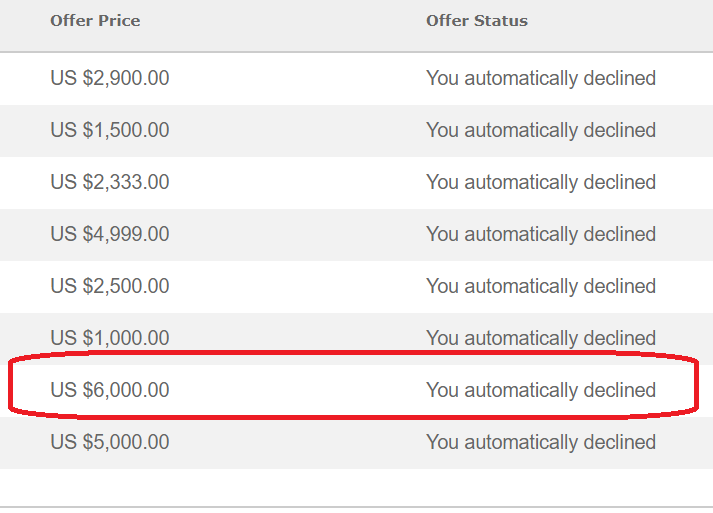 Assuming a person had bought and paid, then you really shouldn’t consider cancelling the the transaction. They monitor best offers and communications between buyers and sellers and there is this warning when doing so. Very true, they do monitor this but I'm certain the review process is at least partly manual. I've had to contact ebay support for shady sellers on a few occasions. Even last year I had a weird exchange with a seller trying to get me to pay outside of ebay using Venmo and suggesting they would offer a discount. That wasn't the only red flag with that seller, so I went to ebay support to get the entire transaction removed. Ebay is shady as hell.. you can get anything reversed by calling them. Just a few weeks ago I bought a brand new (New Old Stock) Zalman cooler from a guy. (as described and pictured by his listing) I received it and it was used as hell, missing the mounts for Socket A that I needed, which was the specific reason I bought it, and the LEDs so dim you couldn't hardly see them lit up. I contacted the seller for a return -- he immediately went on the offense being extremely hostile using expletives saying I was lying and I was trying to scam him and that nobody wins cases against him.. then he immediately called Ebay and they sided with him, despite me providing photographic proof. They invalidated my return and I'm out $30 with shipping. So I called Ebay and they said their agent who talked to him violated protocol, but what was done was done and that other employee "would be coached" and they're extremely sorry. I paid with Paypal, but Paypal says I have to use the Ebay marketplace in order to ask for a refund, which that option is no longer available. There's not even a Paypal case option to generate a dispute request. The only option I have is to call my credit card company to get the charges reversed. I left him negative feedback warning others, and he called Ebay and got that removed too. So... case in point -- if you really want to play the system, all you have to do is call Ebay on the phone and they'll do pretty much anything you want if you act first and act like a prick. But for them to then remove your feedback... That undermines that entire function of feedback!! I do somewhat understand the logic behind removing it but at the same time it's also a little disingenuous. If you remove all negative feedback against someone you can't notice any sort of potential pattern that may be emerging. They may indeed have been 90% happy dealings with him, but that 10% also matters when the buyer isn't happy, even if they are in the wrong (not that you are, just in general). Makes me wonder if he has a friend that's an eBay CSR which he specifically calls and that's why he is so willing to gloat that "no body wins cases against me"? That, or he just has a silver tongue and knows just what to say (con man). On that note, don't know which heatsink you went with but any chance the clip on this one would work with yours? :\ Cheapest vintage Zalman I could find (aside from this one with additional mounting hardware I'm unfamiliar with). It was a Zalman CNPS7000B-CU. I ended up getting mounts from someone on Vogons, and purchasing another new cooler that was actually new and not used. I submitted a claim through my credit card to get the charges reversed on the crappy used one I originally received. I still have two pci 5500's.. one is boxed. heh, any plans for the boxed?